Sunday, October 21, 2018, 2:00 p.m. Bitter cold, dense fog, heavy snow, and record winds: Mt. Washington is known worldwide for its unpredictable and dangerous weather. For a mountain its size, why is Mt. Washington called the "Home of the World's Worst Weather"? Join Mt. Washington Observatory's Will Broussard for an investigation into the unique life and work of weather observers stationed at the observatory year-round. 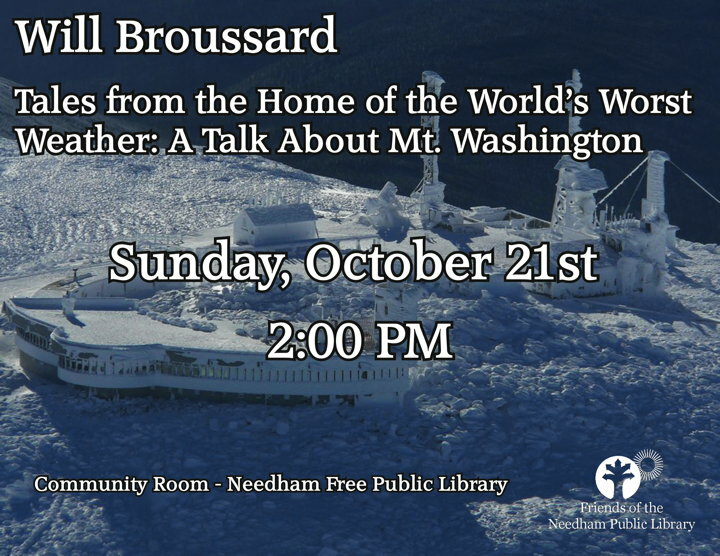 We will explore how the mountain's weather works and what it can tell us about New England's own weather patterns. This exciting program is appropriate for adults and children alike.